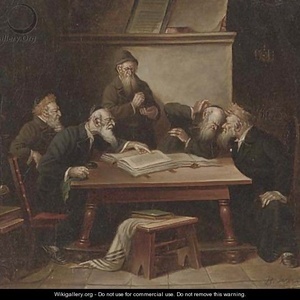 Published: Nov. 27, 2012, 3:48 p.m., Last updated: Nov. 27, 2012, 3:50 p.m.
Rabbis in a debate by B Werner. Source: Wikigallery. Stavudine is an antiretroviral drug that is widely used in Sub-Saharan Africa but barely used at all in North America and Europe. It is much cheaper than other first-line antiretrovirals in use but it has terrible side-effects: lipoatrophy, peripheral neuropathy and, quite rarely, fatal lactic acidosis and pancreatitis. Currently stavudine is dispensed in 30mg doses. The proposed trial, which has received ethical approval and is funded by the Gates Foundation, will compare stavudine 20mg against the current standard of care drug that replaced it, tenofovir. The aim is to see if the lower dose is still effective and has an acceptable side effect profile. This is called a non-inferiority trial. In other words it will test if stavudine at 20mg is no worse than tenofovir. No one sensible believes there's a realistic chance of stavudine at 20mg doing better than tenofovir. Venter wants to run the trial because he is concerned that although there is a drive to reduce the uptake of stavudine in Sub-Saharan Africa, the low cost of the drug means that it will be around for many years and we should find a safer dose if possible. Venter says that international cuts in AIDS treatment funding strengthen the case for the trial. Many clinicians and activists oppose the trial because we think stavudine 20mg is below the standard of care and that the trial won't answer questions about the drug's long-term toxicity because it will only run for 96 weeks. If I was about to start antiretroviral treatment I would want to take the best regimen available to me. In South Africa, patients attending the public health system who start antiretroviral treatment get tenofovir, so choosing a drug like stavudine with its side effect profile would be very risky, even at a lower dose, with no potential advantage over tenofovir. This in a nutshell is why I am opposed to the trial. Graeme Meintjes, one of the debate panelists, made an important point: For some drugs, there is a threshold below which some side effects disappear. For other drugs there are fewer side effects, but they reduce more or less linearly with the reduction in the dose. Meintjes said that before a trial like this can begin there needs to be pre-clinical evidence showing whether stavudine's worst side effects are of the former or the latter variety. If pre-clinical trial evidence shows that stavudine's most serious side effects merely diminish linearly but do not disappear at 20mg then the trial should not proceed because it would definitely be a worse option than tenofovir. The balance of evidence we have from previous reductions in stavudine's dosing shows that a drop to 20mg is likely to have a more or less linear and not a threshold effect on the side effects. Eric Goemaere proposed an interesting compromise. There are several hundred thousand people in South Africa still on stavudine 30mg. Patients on 30mg who are currently not experiencing any stavudine-related side-effects (and there are many of them) might very well have an interest in participating in a trial that sees if they can maintain suppression of HIV at a lower dose. Such a trial would not be offering patients an intervention known to likely be worse than their current standard of care. If HIV remained suppressed for patients taking 20mg, every patient in South Africa who takes stavudine 30mg could reduce their dose. If I were taking stavudine 30mg and I was not experiencing peripheral neuropathy or lipoatrophy I might very well be prepared to participate in such a trial. However, Polly Clayden of HIV i-Base made a point to me which is hard to counter, "You're middle-class with access to the best medical care. If you had been initiated on stavudine, you would have switched to tenofovir years ago." There is a fundamentally important ethical principle that Clayden is insisting upon here and I think it is unanswerable. You have to put yourself in the place of a patient who qualifies for a clinical trial and then decide what choice would you ideally make?1 Nevertheless, given a choice between the trial currently on the table and this modified version, I find the latter more palatable. The debate was excellent and it bodes well for South African medical science that there has been such strong community engagement and interest in this. Thanks for alerting a broader audience to this, Nathan - it would indeed make for a fascinating case study in medical ethics. A note of correction and general comment regarding your footnote, though: you speak of the common underpinning of asking you "to use your empathy faculty, to put yourself in a scenario and to use reason to reach a decision and to then apply that decision universally". There's a whole bundle of concepts there, which unfortunately introduces a contradiction. Kant certainly wants you to reach a decision that can be applied universally, but because not doing so would be logically self-defeating - and not because of anything to do with empathy. Making decisions on grounds of empathy would allow for subjectivity, and also for an appeal to consequences, both of which he would have objected to. The general comment is that the Golden Rule is not (for me, at least) as persuasive as people seem to like to think. It only has force if I already care about your interests - but it gives me no motivation to care about your interests. To put it another way: I can say "sure, I wouldn't like it if you did that to me. But I'm doing it to you, so what's your point?" In other words, if I think I can get away with "it", you're just asking me to reflect on the repercussions of making a bad gamble, which doesn't mean I need to change my mind. Thanks for that Jacques. Apologies for the error in the footnote. A warning to myself not to wander beyond my area of knowledge.